We know the sheer bliss of being in Love… that place of total acceptance. Come and join me… for a 6 week gaze into a love affair that is always available to us. It does not rely on any other person but is cultivated within and only deepens as we realize just how connected we truly are. Mind, Body and Spirit engaged, we will lean into our connection with Our Creator, Ourselves and Others. 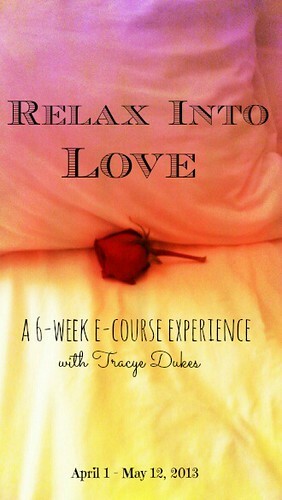 Through visioning, positive meditation, soul assignments, Sharing Light and Circling with one another in a private facebook group, we will learn together, how to relax… into Love. Beginning April 1st, you will receive email prompts 5 days per week with exercises and instruction. We will circle mostly in our fb group to share our insights and support. For those of us who are in the Tampa area, we will end with a physical gathering… to connect and celebrate! This offering is one of first steps in the next phase of my life, as a Spiritual Guide and Life Coach. As a promotional offer, I would love for as many to join is as can. After our initial experience, this course will be priced at $39. If you join us on this April excursion, I am giving you the option to pay what feels right for you (min. $5.00).